This is part 2 of my MKR1000 article, in this previous post I looked at sending a Message via EWS using Basic Authentication. In this Post I'll look at using the new Outlook REST API which requires using OAuth authentication to get an Access Token. The prerequisites for this sketch are the same as in the other post with the addition of the ArduinoJson library https://github.com/bblanchon/ArduinoJson which is used to parse the Authentication Results to extract the Access Token. Also the SSL certificates for the login.windows.net and outlook.office365.com need to be uploaded to the devices using the wifi101 Firmware updater. These boards are pretty cool and take you back in some ways to 80's with some of the programming challenges that come with memory restriction devices. Eg the MRK1000 has 32Kb of SRAM which is half that of Commodore 64 although it runs at 48Mhz vs the 1.33 Mhz the Commodore could manage (I know this isn't a fair technical comparison just trying provide a bit of contrast). 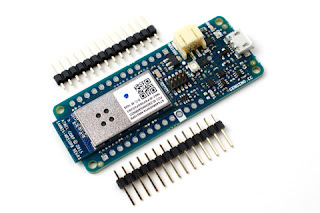 The nice thing with this board also is because it implements a cryptoauthentication chip it can do SSL communication which can be problem with low power boards because of the amount of processing power required for SSL. So at the bare bones this board can run code and logic that will allow HTTPS communication. Once you do that you ready to use the following Sketch the code is relativity simple, with EWS on Office365 it supports Basic and Oauth authentication as this is just for prototyping I've gone with basic auth which means you just need a Base64 library to do the encoding of the authentication header. then when you upload the sketch and connect to the serial port on the MRK1000 it will try to connect to the WIFI and then run the SendMessageEWS function.